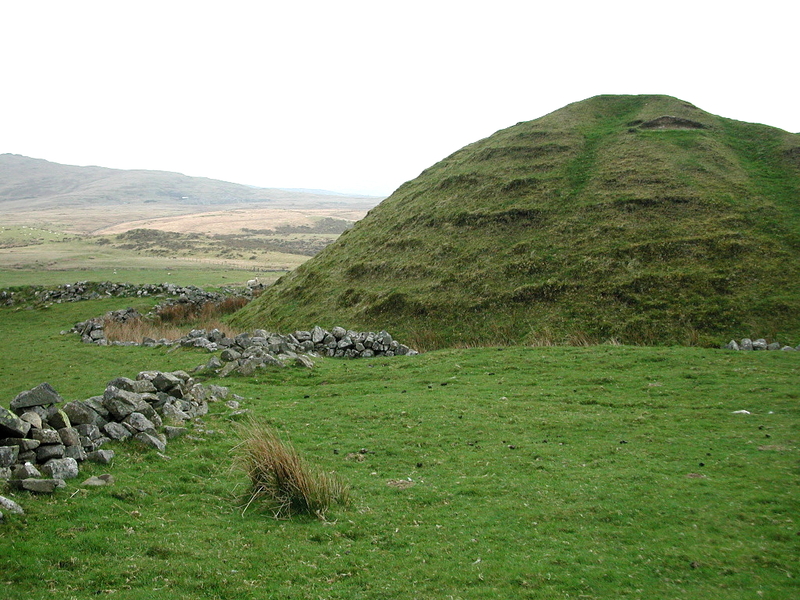 Above: the steep-sided motte castle of Tomen y Mur viewed from the north. 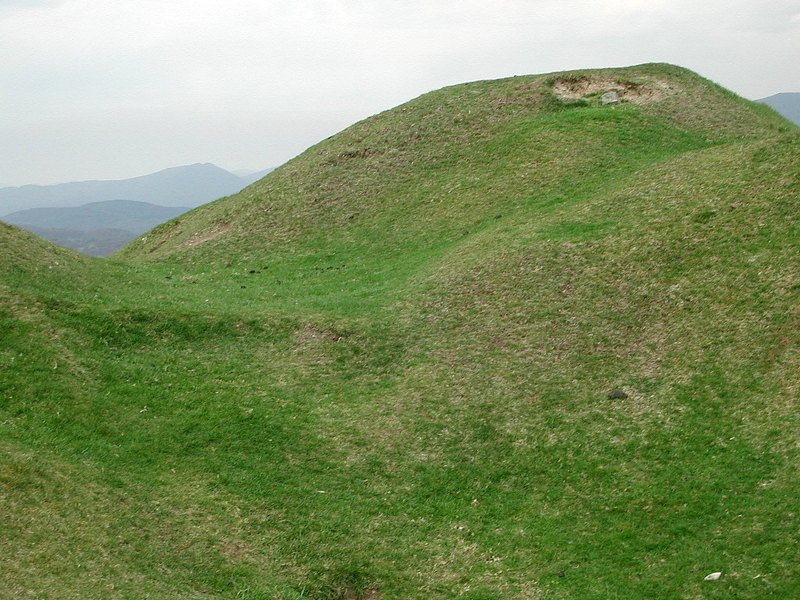 The medieval motte castle rests amid a complex of earlier Roman ruins. 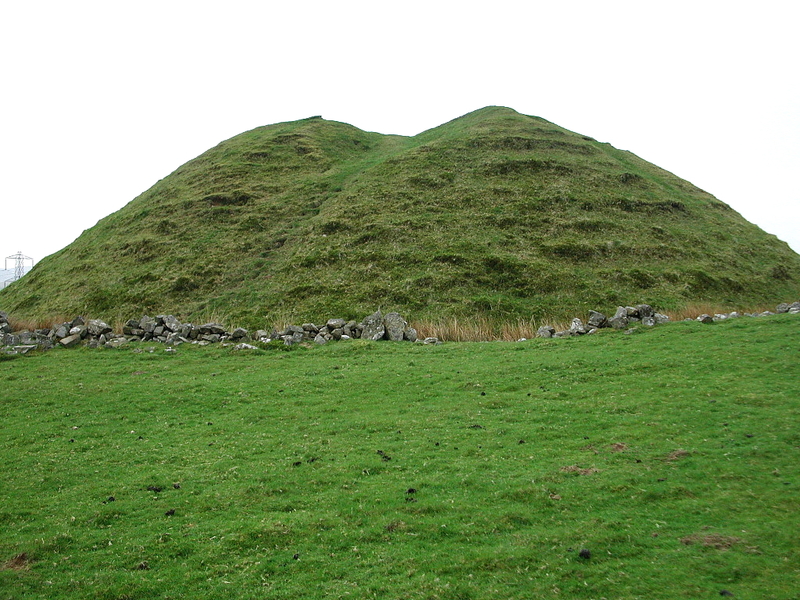 Below: view of the motte from from the (proposed) Roman road. 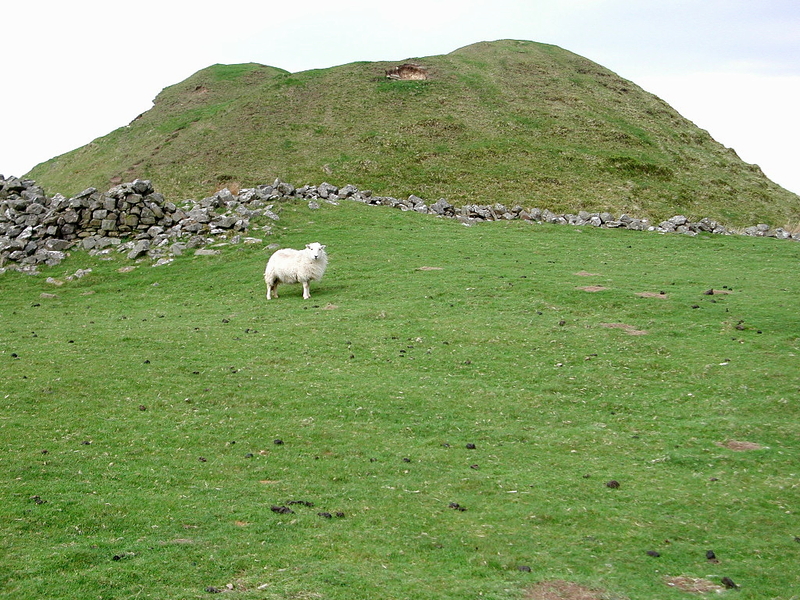 "The mound of the wall", possibly a Norman motte raised inside the angle of a 1st.c. Roman station. 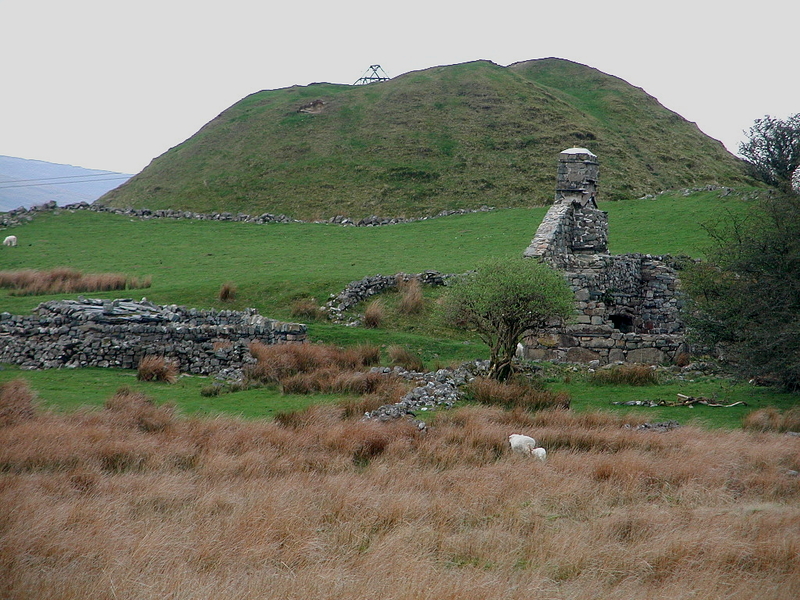 Mur Castle, Tomen Y Mur, belongs to the old Celtic mythology; to the Romans, whose most lonely western outpost on the military highroad between Caerhun and Pennal it was; to the princes of Gwynedd and Norman kings, all of whom occupied the quiet inconspicuous pudding-shaped hill top mound. 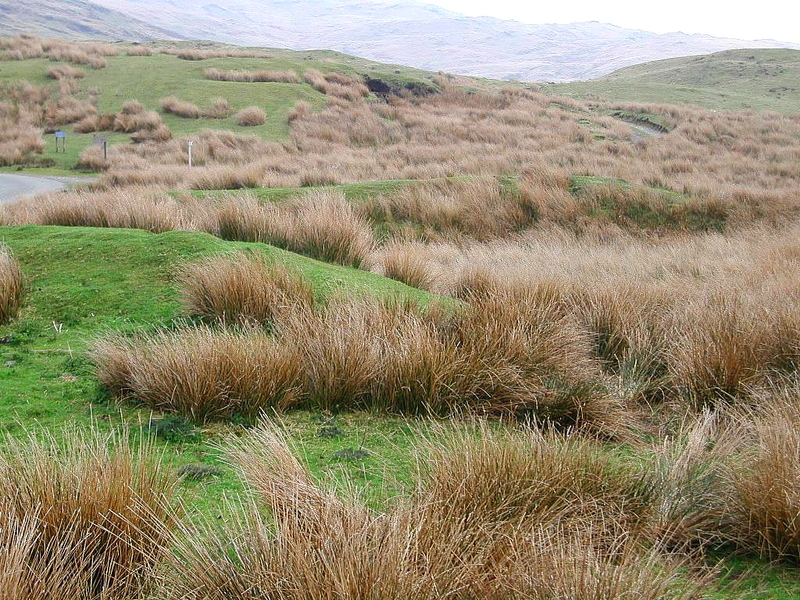 It was a dreary site, disliked most heartily by the soldiers and hardly preferable to a posting on Hadrian's Wall. In addition to the usual military buildings, parade ground and bath house, the troops were provided with an amphitheater for sports and games to relieve their tedium. 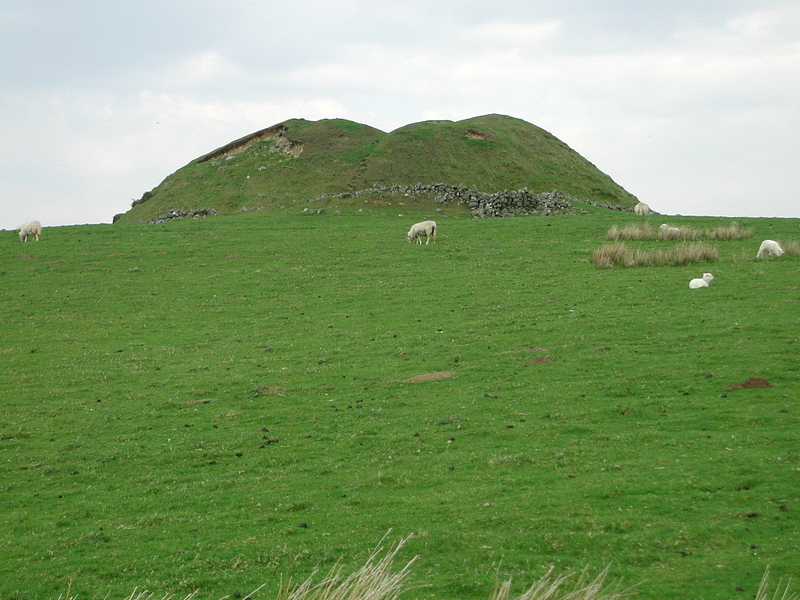 Princes of Cunedda's line moved in when the cohorts departed, and about the time of the Conquest they defended their courts by earthworks like those of a motte-and-bailey castle; this the Normans took over in the XIIth C.
In later days a mound was built in the centre of the fort by William Rufus, but his occupation, like that of the Romans, was of short duration, and he was glad to get home in safety from the terrible Gruffydd ap Cynan. Henry I is also said to have penetrated thus far, and to have fled just as precipitately. When Lleu left his wife alone, to visit Math in Arfon, Blodeuwedd found the loneliness of Mur Castle unbearable. To fill in the irksome time of waiting she found solace in the company of a young lord of Penllyn - from Caer Gai by Bala - and was "filled with love of him". 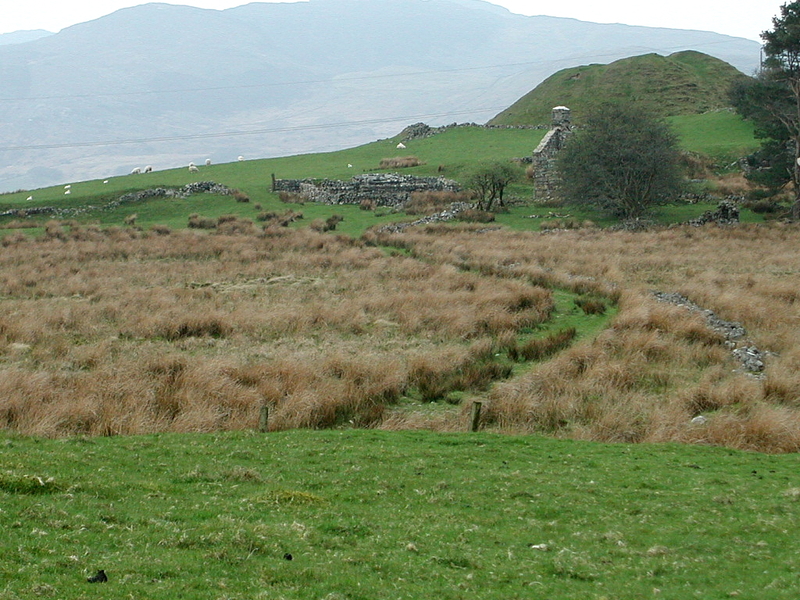 They gazed into the mountains and sighed and plotted Lleu's death. No easy matter, for,"he could not be slain inside a house, or outside, nor on horseback or afoot". No weapon would kill him save a spear which would take a year to forge, and that only when "folk were at Mass on Sunday". They found a way, and when Lleu was taking a dip in the Cynfal river Gronw Pebyr shot the poisoned spear through him. At once Lleu became an eagle soaring high, and was seen no more. 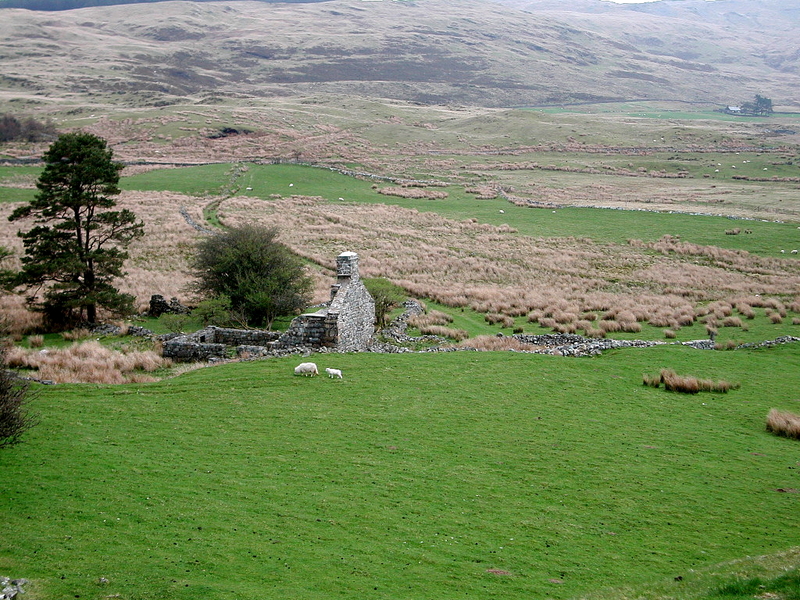 Later through the magic of the Children of the Don, Lleu was restored, and good physicians of Gwynedd brought him to health. Then they made for Tomen Castle. But Blodeuwedd and her maidens fled north towards the mountains where Gwydion caught up and changed her into an owl,"because of her dishonour and her evil never to show her face again by day". 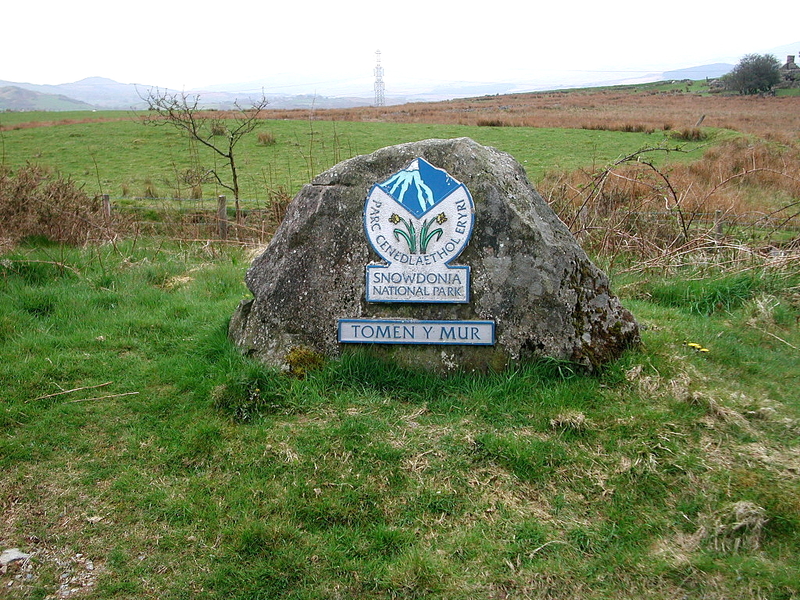 The maidens rushed headlong into a lake called after them, Llyn Morwynion, the same in which some,or all, of the abducted women of Clwyd chose to end their lives. Gronw came to the sticky end he well deserved. For a year he had subdued and ruled over Lleu's land. 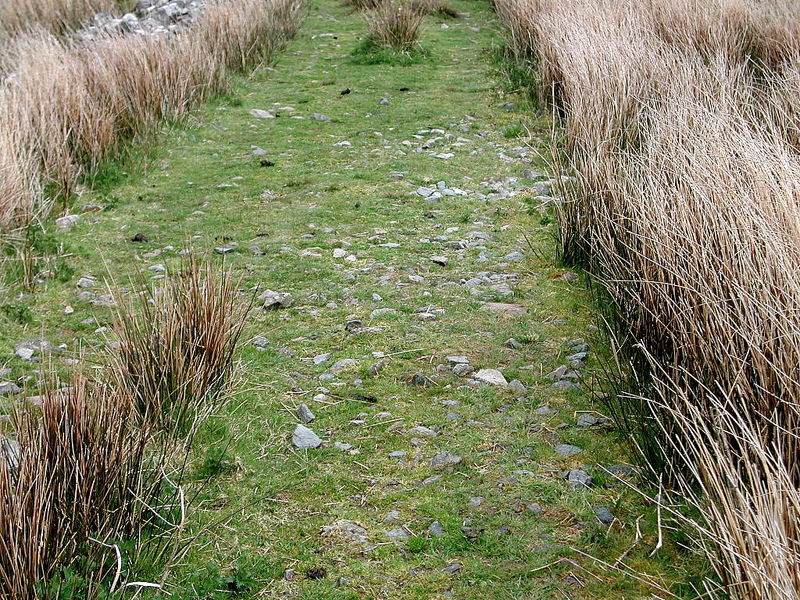 His reparation of all the gold and silver in Penllyn Lleu refused, instead bidding him to go to the spot where with the poisoned spear he had attempted his murder. Lleu followed and when his enemy faced him, his back against a rock on the Cynfal banks, the hero hurled the spear pinning Groaw to what is still called Llech Ronw. 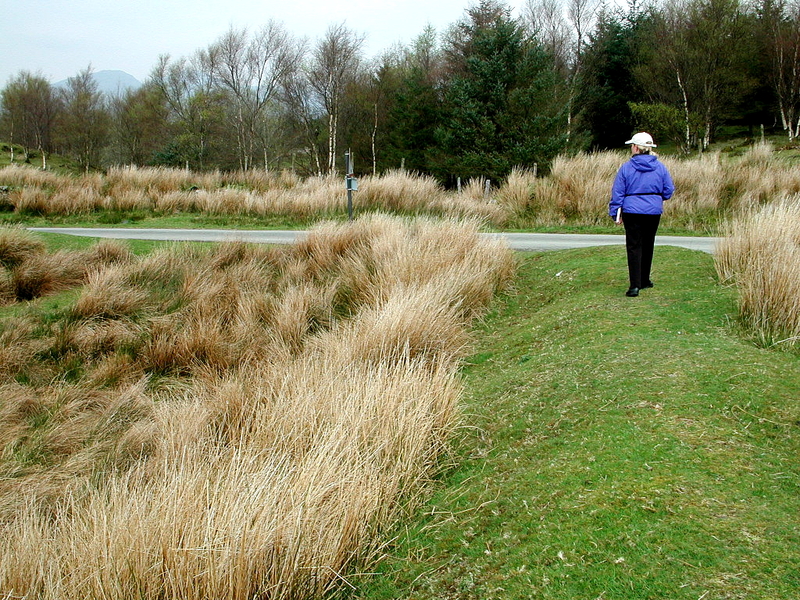 Jessica Lofthouse "North Wales for the Country Goer"
Below: this marker is found at the car park for Tomen y Mur. 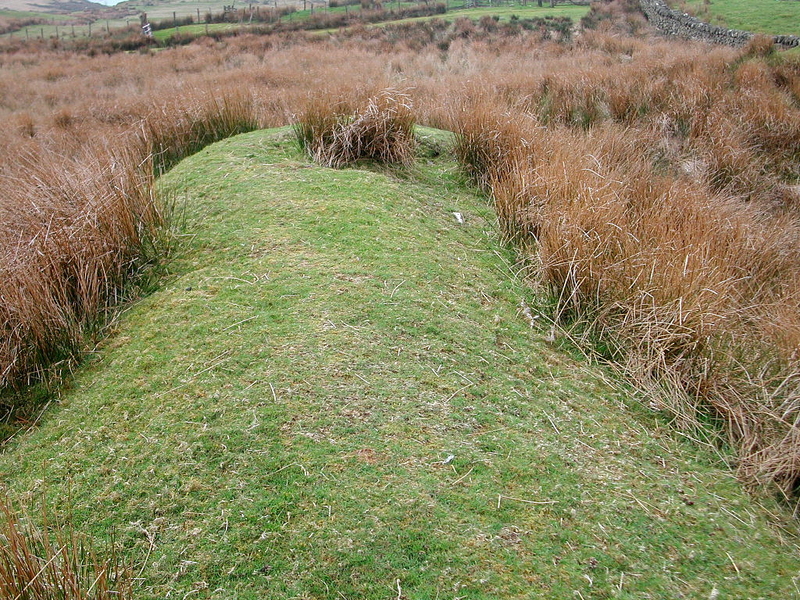 Below: this photograph gives some indication of the steep slope of the motte. 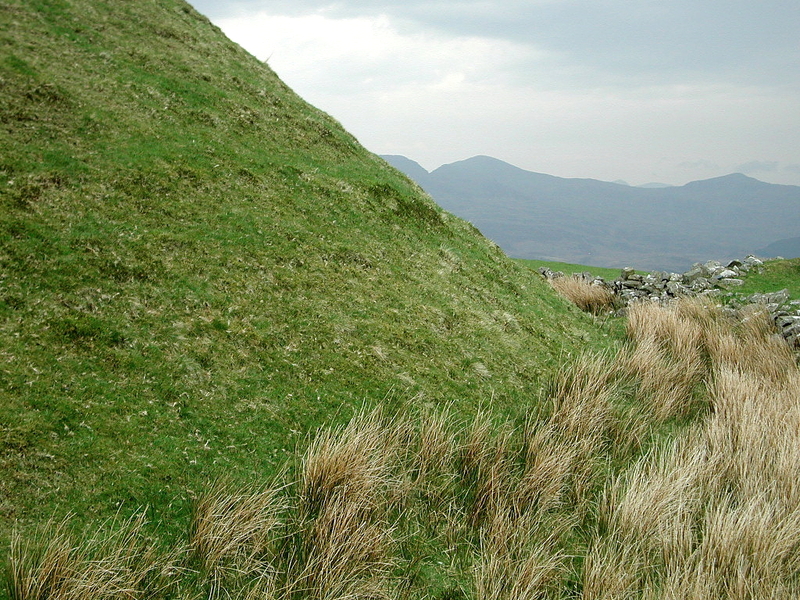 Below: view across the unusually hilly summit of Tomen y Mur. 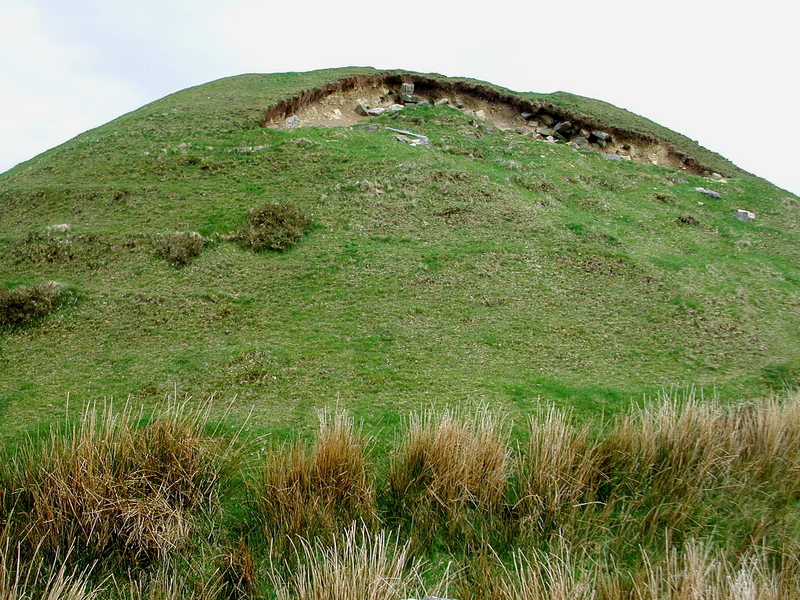 Most surviving mottes are flat across the top. 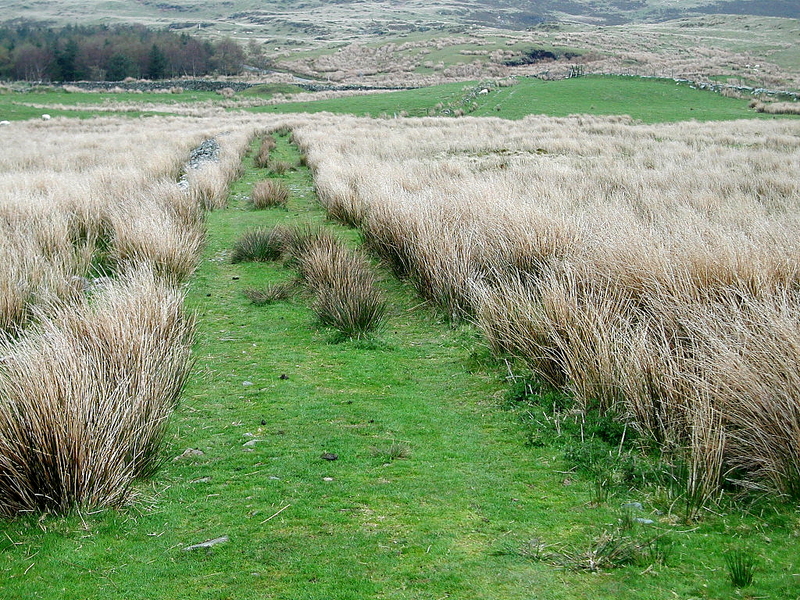 Below: view of the proposed Roman road that leads to the site. of the small Roman amphitheatre located near the car park. 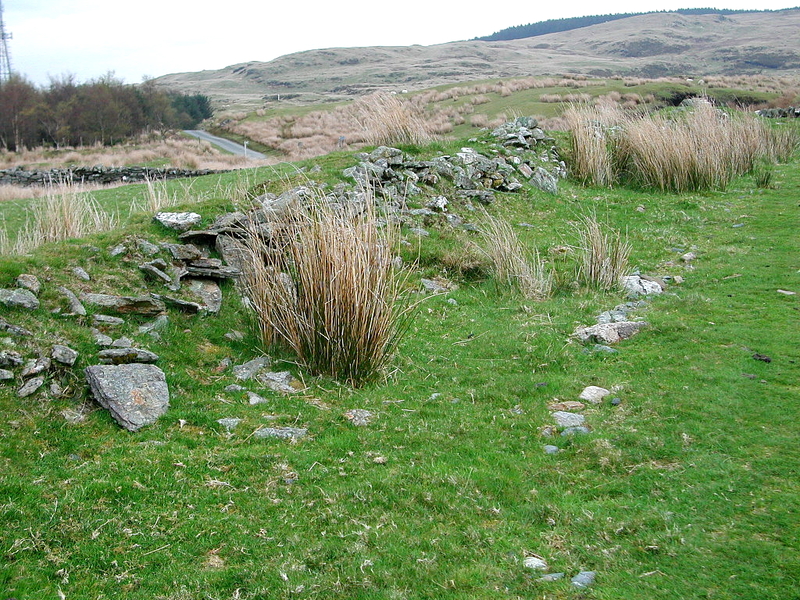 Additional view of the amphitheatre walls. 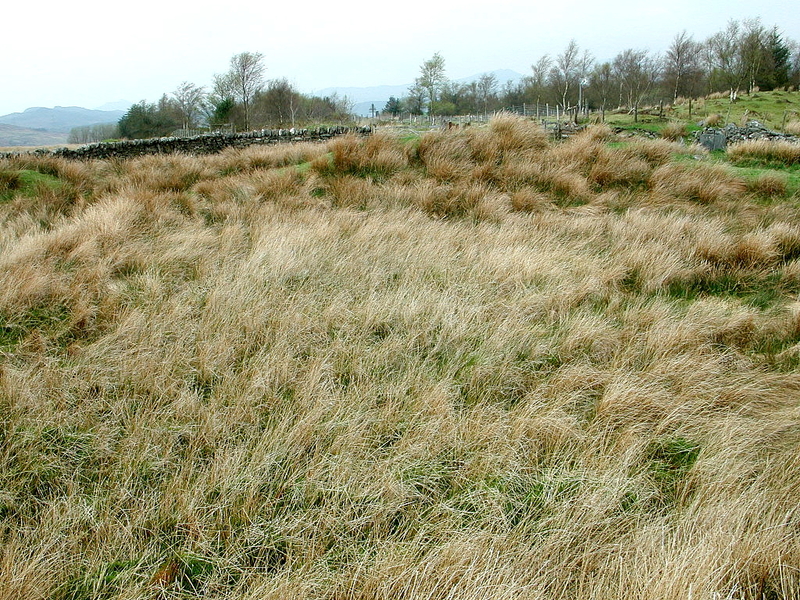 In this photo the amphitheatre is to the left of the grass-covered wall. Today sheep have replaced the soldiers at Tomen y Mur.